Puppies - Website of jackofspades! • A dog bred from healthy parents with uninhibited, social and level-headed characters and restricted kinship. • From the day of birth you will be kept informed on the progress of the puppies via this website and by email. • The puppies grow up in our living room (and are allowed in the garden weather permitting) and are being carefully socialised. • As of about three weeks of age you are welcome to visit the puppies. • During your visits you will receive all information you need for when the puppy goes home with you. I will be happy to answer any question you might have. Furthermore, you will receive a practical book about raising your puppy should you need one. • Before you take your puppy home, it will be vaccinated, wormed and its health will be confirmed by a vet. • The puppy will be delivered with an official pedigree (NHSB - Dutch dog studbook), a European pasport and a sales-contract. 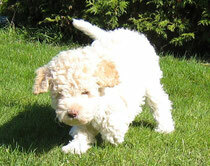 It will also have been microchipped by the Dutch Kennel Club (Raad van Beheer). • Furthermore, you will be provided with a stock of food the puppy is used to, a piece of the blanket from the litter and his or her favourite toy. • After you have taken your puppy home you are most welcome to phone or email with any question you might have about your puppy. Within a year after birth we will organise a litter-reunion.